Designed by Billy Boat the Legendary Indy 500 Racer and his company B & B. Known throughout the Viper community as the best performance exhaust systems you can buy for the Dodge Viper. Same cat-back system as part # 0122(see below), but is designed to fit directly to all B&B brand headers without any other parts necessary. Does not include catalytic converters. Pipes are straight between header outlet and muffler inlet. Features a true X pipe, which provides an aggressive, rich rumble at idle and outstanding full throttle tone. 4.50″ Slant Cut Elliptical Tips. It is 100 % Stainless steel system. Add more venom to your Dodge Viper SRT-10 with a performance exhaust system from Billy Boat Performance Exhaust offering unparalleled performance, sound and style. 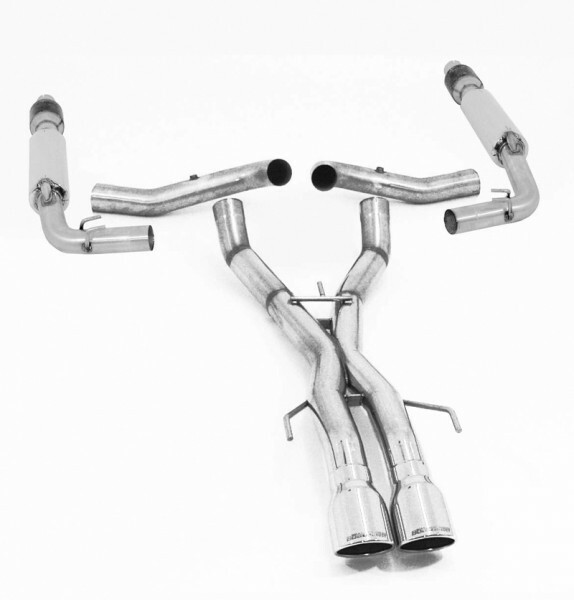 The B&B header back exhaust system for the Dodge Viper SRT-10 id history in the making! Mandrel bent and completely TIG welded this 3 Inch stainless steel system offers remarkable performance and torque gains throughout the entire RPM range. Available with or without high flow metal catalytic converters, both systems include rear crossover pipe and fully polished side exiting tips. Complete with high quality hand craftsmanship and backed by a limited lifetime warranty Billy Boat Performance Exhaust offers ″ A moment of adrenaline and a lifetime of performance!″ for both header back systems for the Dodge Viper SRT-10.